Lying down in an enclosed, water-filled tank may not seem like the best way to relax, but at Float Harder, relaxation is the goal. Owned by Amy and James Harder (hence the name), Float Harder is a dedicated flotation center, which has three float systems–two float pods and one float room. Earthbound aquanauts recline back in highly salinated water set to skin temperature–the salt provides the buoyancy and the temperature makes it nearly impossible to distinguish air from water from skin. And they simply float. That’s it. For 90 calm, decompressing minutes. Float Harder opened in April on outer Washington Avenue in Portland. It features a cozy waiting room with a large couch and a complimentary tea station, which is heavily guarded by the couple’s tiny Yorkshire terrier, Charlie. Beyond the front desk, the float pods and float suite are in private rooms. There’s also a tidy restroom and a “prep room” with hair dryers, contact solution, lotion and other items that make it easier to transition back into the real world. The cost is $65 for a 90-minute float. Package deals and special membership rates are also available. I’ve experienced floating before, but in early September, I made my way to Float Harder for a second go. And the second time is the charm. Many first-time floaters spend most of the session getting used to the tank and processing the sensation of floating. 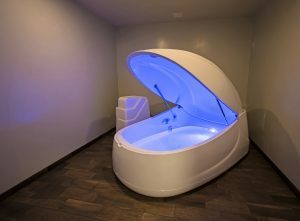 My first time, I chose the Quest Float Suite, a flotation room that is exactly the size of the walk-in closet I wish I had. After lots of experimentation with light, sound and body position, I only truly relaxed for the last half hour of the 90-minute session. I wish I could say it was a profoundly spiritual and creative time, but my delayed meditation took me only so far. I spent my time in the dark figuring out the best configuration for the furniture in my apartment (which I have not yet adopted). The Evolution Float Pods look more like giant clams designed by Steve Jobs. (Guests are split on which system they prefer, say Amy and James.) I lean toward the suite and would recommend it to first-timers who worry they may get claustrophobic. It’s a bit more spacious, though you can’t tell the difference when you turn the lights out. With both options, you can select light color and music. Both music and lights can be controlled from within the suite or pod (there are big buttons that can be found by touch in the dark). There’s also a button that connects you by intercom to the front desk, in case you have questions or feel any discomfort. During my second float, I felt like an old pro already. I picked purple lights and an instrumental version of Pink Floyd’s “Dark Side of the Moon,” and made my way into my private float room, where I undressed (did I mention you float naked? ), removed my jewelry, popped in my complimentary earplugs and showered off. (There are private showers in each room, and unscented soap and shampoo are provided.) Showering helped ensure I wasn’t trailing any oily or scented products into the tank. You can wear a bathing suit if you prefer, but floating in the buff is recommended. When sensory input is limited (which is the whole point), you’ll take notice of small things like a snug swimsuit strap (which might become distracting). The water temperature is a comfortable 93.4 degrees, which is about the same as your skin. It’s also the optimal temperature for dissolving the salts that make the water so wonderfully floatable. (Even if you can’t float in a pool, lake or ocean, you will float in a float tank, guaranteed). The salts do make your skin feel a little slimy, but that’s just the Epsom salt working its magic. It’s good for the epidermis and works as a topical anti-inflammatory, which, combined with zero gravity, offers a lot of relief for achy muscles and joints. In the pod, I started out with purple lights on and Pink Floyd rocking full blast. By the time I got to “Time,” the third song on the album, I was turning out the lights and preparing to blast off into my own brain. Then I cut the sound entirely and relaxed into dark, quiet nothing. People are not used to sensory deprivation. We’re accustomed to a lot of input, and when our brains don’t get it, they tend to make things up. During both of my floats, once the lights and sound were off, I saw some wavy lines and spots and occasionally felt as if I were spinning or tipping. But it wasn’t scary. In fact, your brain can really get some mental work done (you know all those genius ideas you come up with in the shower? Floating is like that, on steroids). I set an intention to work through some plot points and details of a short story I’m writing, and it worked. The minutes sped by, and when the lights came back on to signal the end, I had to double-check my phone to confirm that it had really been 90 minutes. Time sure flies when you’re floating in the dark. Jeanee Dudley is a writer and editor living in Portland. Her work has been featured in Portland Magazine and New England Magazine and she is currently working on a collection of short fiction. When she’s not thinking about commas, she enjoys craft beer, the outdoors and collecting pretty, old junk.